Life Scout Joe Boyer of Troop B111 zips through the canopy tour. BSA photo by Tom Copeland. 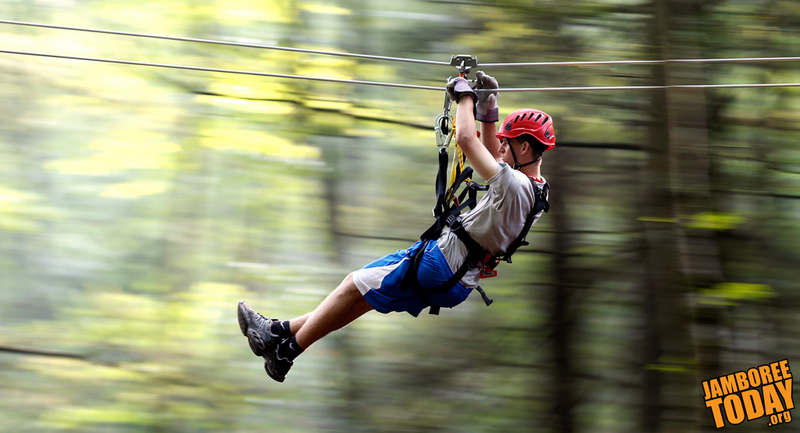 The Gateway and Legacy Zip Lines in Scott Summit Center are 1,400 feet and 1,700 feet long, respectively. At the Big Zip, can travel 3,200 feet., at up 65 miles per hour, high above Bravo Lake, according to Eagle Scout Aaron Parks-Young of the aerial sports staff. "It was pretty awesome," said Life Scout James Alexander, upon landing at the end of the Big Zip on the outskirts of Summit Center near Bravo Lake. The launch platform however, was a 45 minute walk from there. The thrill, it seems, was worth the hike. Scouts and Venturers who missed out on the zip lines — or didn't get enough of them — are invited to return to the Summit for the summer programs offered in 2014. Summer campers will get a special benefit: Shorter waits. Of course, Big Zip's 45-minute hike will be the same length. For a first-hand view of zipping at the Summit, check out this video from Jamboree Today's Eric Vickery and Tim Underhill.